Following five hours at anchor this afternoon in waves the size of double-decker buses, the Islanders began rowing again at tea time. Tonight the crew in the Black Oyster were at anchor again, seeking shelter in the lee of a bay near Minerstown, south of Belfast. 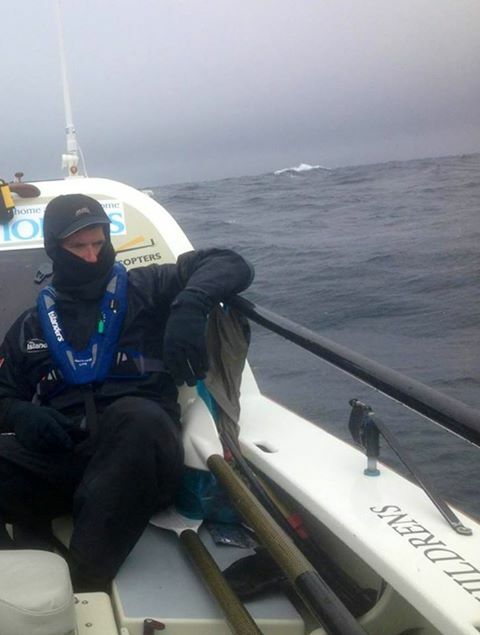 After a shift last night where real progress was made – often racing at more than five knots – it was disappointing for Josh Taylor and his crew of four to have to sit out the weather for hours on end. The Islanders posted this photo of Gavin Sheehan on deck, with huge waves and white horses all around. More than 100 miles south, Jason McKinlay and Josh Tarr in Savoir Faire are making more than two knots in the Irish Sea between Wexford and Aberystwyth. See the posting below from Jason, on life in the Irish Sea and looking ahead to a storm brewing on Thursday.